18 favorites, each presented in two versions: a simple lead sheet arrangment with melody, lyrics and chords; and an advanced solo arrangement that combines the melody and accompaniment. 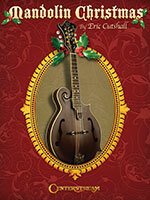 Includes: Adeste Fideles � Deck the Halls � The First Noel � Good King Wenceslas � Jingle Bells � and more. 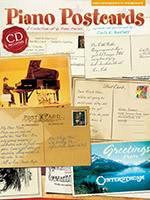 These early intermediate to intermediate �piano postcards� from Carla Bartlett use light classical and popular music styles to communicate feelings and hopes. The CD features Carla performing the pieces. 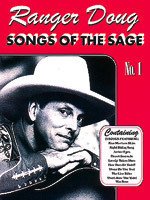 Features original western songs from Grammy award winner Ranger Doug Green, the idol of American youth and member of the popular western singing group Riders in the Sky. Includes 25 songs from their many recordings: Blue Montana Skies, Night Riding Song, Here Comes the Santa Fe, That's How the Yodel Was Born, Lonely Yukon Stars, Prairie Serenade, and many more. Features the story behind each song, plus lots of photos. Contains great songs of the New and Old West in melody line/lyrics/guitar chord arrangements, poems, photos and illustrations, and fascinating facts and the background history of the West. Songs include: Whoopee Ki-Yi-Yo (Git Along Little Dogies), The Old Chisholm Trail, Carry Me Back to the Lone Prairie, Home On the Range, Bad Brahma Bull, I'm Just a Little Cowpoke, more. CD includes Ernie Sites singing the songs and reciting the poems. 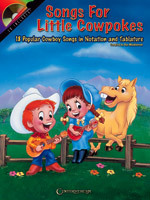 18 popular cowboy songs in standard notation and tablature, compiled with young strummers in mind. Includes a play-along CD, historical facts, and pages for kids to color. Songs include: Home on the Range, Ragtime Cowboy Joe, Red River Valley, Yellow Rose of Texas, Green Grow the Lilacs, and more.